Yet another uncompleted project, this big two-seater night-fighter was designed during 1917. Many of its major components, including the undercarriage, tailbooms and centre-section, were F.E.9 components, possibly derived from the cancelled production of that machine. The nacelle was basically an F.E.9 unit with the crew positions reversed, presumably with the intention of providing the pilot with the best possible view of his intended target and also to facilitate landing at night. Like the F.E.9, it was to have been powered by the 200hp Hispano-Suiza. Armament was to have been a Vickers rocket gun, and two searchlights were to have been fitted, one in the extreme nose and the other fixed to the gun. Power for these lights was to be provided by a wind-driven generator. Before completion the design was modified to become the N.E.1, and is further described under that designation. Developed from the F.E.12, the N.E.1, or Night-flying Experimental, employed a number of standard F.E.9/F.E.12 components, including the tailbooms, undercarriage legs, rudder and tailskid. The three-bay wings were of equal span, and had generous dihedral outboard of the centre section. Ailerons were fitted to upper and lower mainplanes. Heeding the lessons learned from the development of the F.E.9, the ailerons were plain and unbalanced. The tailbooms were parallel in plan, and followed what had become normal Factory practice by meeting at the tailplane spar, the tailplane itself being positioned on the thrust line. The elevators incorporated large horn balances, and the semi-circular fin was symmetrical about the tailplane. The undercarriage had a very wide track, the wheels being outboard of the innermost pairs of interplane struts, to facilitate landing at night. Therefore, unusually for the period, the two undercarriage legs were entirely separate, with no transverse axle. Power was provided by a 200hp Hispano-Suiza driving a four-bladed pusher propeller. The intended armament was the Vickers rocket gun or the one-pounder Coventry Ordnance Works gun, with which an element within the Factory seems to have been obsessed. As in the F.E.12, a searchlight was included in the nose of the nacelle, powered by a wind-driven generator. Six prototypes, B3971-3976, were ordered, the first of which was inspected on 3 September 1917 and made its initial flight five days later. On 14 September it was damaged, most probably in a landing accident, and the nacelle was rebuilt with the crew positions reversed, moving the pilot to the rear cockpit, where a Lewis gun was mounted on the starboard cockpit coaming for his use, in the manner suggested for the F.E.9. The searchlight was not refitted. Test flying resumed on 4 October. Service trials started on 6 November at Martlesham Heath, and the resulting report cast doubts upon the adequacy of the N.E.1's performance compared with that of its contemporary 'rivals'. While it was considered to be a slight improvement on the F.E.2b, which it was thought most likely to replace, and while the view from either cockpit was described as excellent, it was found to be heavy and awkward, although generally easy to fly. As the N.E.1 was neither smaller nor much better streamlined than the F.E.2b, it was hardly surprising that its performance, with similar power, was so little better. The general lack of enthusiasm on the part of its intended users was sufficient to ensure that the N.E.1 did not enter volume production. Nevertheless, all six prototypes were completed, most probably because they were already well advanced. In fact the second, B3972, was completed by 14 November and, after acceptance trials, was handed over to the RFC, serving with No 78 (Home Defence) Squadron at Sutton's Farm. It is probable that this machine was built without the searchlight or rocket gun, and it may have had the modified nacelle then fitted to B3971. A redesigned fin, with increased ventral area, was fitted to B3973, which was completed on 23 November. Early in the new year this aircraft was fitted with bomb racks under the lower centre-section, and throughout February and March it took part in bomb-dropping trials at the experimental station at Orfordness. The fourth prototype was not flown, being used exclusively for static experiments, and may eventually have been tested to destruction. The fifth example, B3975, was completed late in December 1917 and flown by the experimental station at Orfordness and at the Isle of Grain, but for what purpose is not known. Although the final machine, B3976, was completed, it was never fitted with its engine and obviously was not flown. N.E.1. The N.E.1 was first constructed late in 1917 as a specialised night fighter. It had a counterpart in the Vickers F.B.25 and was developed from a design bearing the designation F.E. 12. In this design the pilot was in the front cockpit and was provided with a Lewis gun. The primary armament, however, was a Vickers rocket gun, manned by a gunner at the rear. For this gun two mountings were provided, one for frontal fire and one for firing rearwards above the top wing. Provision was made for two searchlights, one in the nose of the nacelle and one on the forward mounting for the rocket gun. As first flown in 1917 the N.E.1 had no searchlight on the forward rocket-gun mounting, and later the light in the nose was discarded. This enabled the gunner to be brought forward to the front cockpit, where he was afforded a wider field of fire. The rocket gun was on a bipod mounting at the front tip of the cockpit, and on the starboard side of the fuselage was a fixed Lewis gun. Provision may also have been made, or intended, for a pillar-mounted Lewis gun for rearward fire. 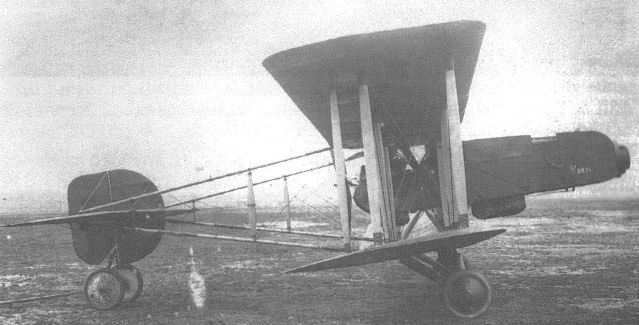 Early in 1918 one N.E.1 was used for bombing experiments. As a derivative of the F.E.9 (which see), the RAF planned to develop a dedicated night fighter as the F.E.12. This was to have used the same 200 hp Hispano-Suiza eight-cylinder Vee-type water-cooled engine, the same undercarriage, tailbooms, tail unit and wing centre section as the F.E.9, and basically the same nacelle, but with the crew positions reversed. New equi-span, three-bay wings were planned, with plain unbalanced ailerons. The pilot, in the front cockpit for the best possible view during unaided nocturnal operations, was to have a forward-firing 0.303-in (7,7- mm) Lewis gun, whereas the observer was to be armed with a Vickers rocket gun for which two mounts were to be provided for firing forwards or aft. Provision was to be made for a searchlight in the nose, and another on the forward mount for the rocket gun, with a wind-driven generator under the nacelle. Six prototypes were planned, but before construction began the designation was changed to N.E.1 (for ‘‘Night-flying Experimental”) and some changes were made. These eliminated the second searchlight, increased the span of the wing centre section, changed the tail unit design, moved the boom attachment points on the tailplane outwards, and introduced a wide-track undercarriage with a divided axle arrangement. Flown early in September 1917, the first N.E.1 was almost immediately damaged and was then modified, before resuming flying on 4 October, to accommodate the observer in the front cockpit with the rocket gun and the pilot behind with a fixed Lewis gun. In this form, the N.E.1 was submitted to official trials at Martlesham Heath in November 1917, but was not thought to have adequate performance to serve as a night fighter. The other five prototypes were all completed by January 1918, but one was used only for static testing, another probably remained unflown and only one was issued to an RFC squadron for home defence. Max speed, 95mph (153 km/h) at 10,000 ft (3050 m), 85mph (137 km/h) at 16,500 ft (5 030 m). Time to 1,000 ft (305 m), 1.6 min. Service ceiling, 17,500 ft (5335 m). Empty weight, 2,071 lb (939 kg). Loaded weight, 2,946 lb (1336 kg). Span, 47 ft 10 in (14,57m). Length, 30 ft 2 in (9,19 m). Height, 9 ft 8 in (2,94 m). Wing area, 555.1 sq ft (51,57 m2). The first prototype N.E.1, showing its original nacelle and the nose-mounted searchlight. 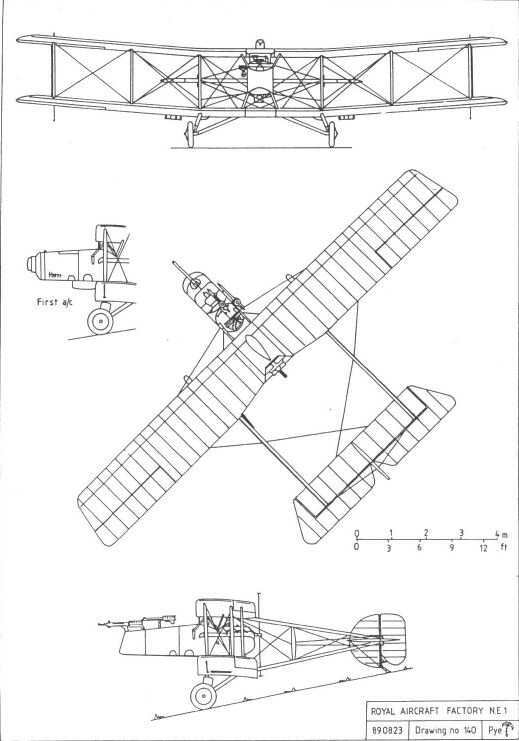 Royal Aircraft Factory N.E.1 original version with searchlight in the nose. N.E. stood for Night-flying Experimental. The N.E.I B3972 fitted with experimental armament. N.E. 1 B3970 with increased area to its ventral fin. The N.E.I B3975 during bomb-dropping trials at Orfordness. Note the bombsight fitted to the rim of the forward cockpit.